Out of various material types, carbon fiber is considered as the toughest and lightest. 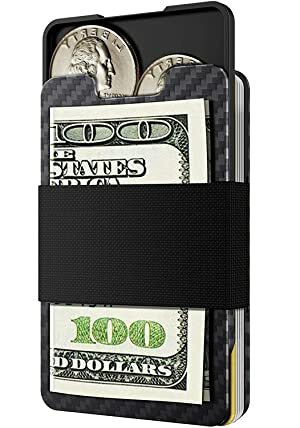 Even a drop off skyscraper, a carbon fiber wallet still stays intact with no damage of its inner content. Not to saying that those products made out of carbon fiber weave have really impressive outlook to be a fashionable item of yours. The only minus of this material is price. Yes, it’s arguable the most expensive out of a bunch. 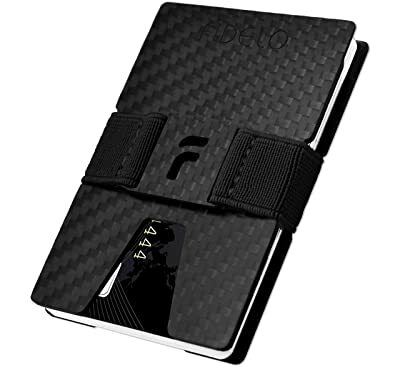 However, that isn’t synonymous that a person with tight budget can’t have a carbon fiber wallet for him. This round-up list collected from the best quality products out there will suggest you some. Take a peek! First off, is its high-quality material. 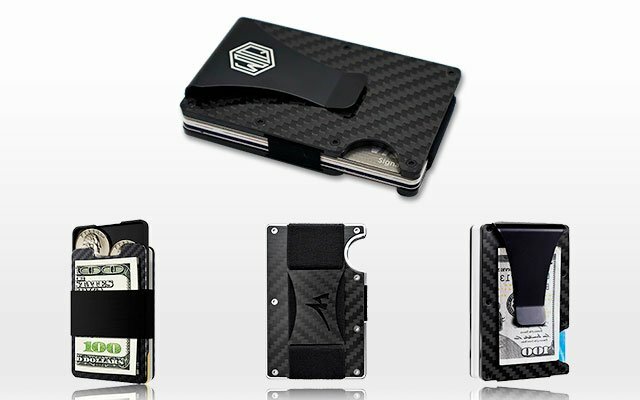 The whole wallet is crafted from 100% REAL carbon fiber (if you choose the black one like me). But in other colorways, it might be different that’s refined aluminum. Either of them is arguably durable, sturdy and protective. But if you prefer the sturdier, my recommendation is black. Other than that, there’s built-in RFID Blocking Technology which I really appreciate because in this modern time, wireless thieves are very popular. Whenever going outside, especially in a crowd, your private information is always in risk of being stolen by bad people. So, this feature is the easiest way to protect them. As I expected, the wallet comes in minimal structure with a money clip, two metal pieces, and screws. The best thing about it is you can adjust the wallet to fit your daily carries within 1-12 cards and less than 5 folded bills. Or, for more minimal construction, you can remove the clip just by undone the screws. It’s a preference issue! If this is your very first time trying the BSWolf’s products, I’m pretty sure that their 1-year warranty will ease you mind significantly. Next, we’ve got this FIDELO. It arrives in same-same measurements as the BSWolf carbon fiber wallet above, but ways more flexible (at least in my standards). Since the money clip now is altered by an elastic strap, (plus, 4 different colorways to choose from) it doesn’t cause bulk underneath your pocket at all like the stiff metal money clip. Besides, is the leveraged capacity up to 10 folded bills. In terms of the card holder’s capacity, it’s also huger than the BSWolf, which is now 15 cards. Thanks to its superior ultra-modern design, made with high-grade material, this 3K carbon fiber comes in stronger texture than other kinds of steel with higher durability and scratch resistance despite its thinness. With this, you can freely customize your carrying and place it anywhere you want it to, from trousers, shirts, pants, jeans, and jacket pockets. Or, in your backpack as well. Don’t worry, it’s equipped with RFID Shield, which can block 13.56 MHz frequencies efficiently. And plus, is a 1-year warranty to ensure your highest satisfaction with this purchase. The package from Roll Aoraki Rock Ridge is very unique. 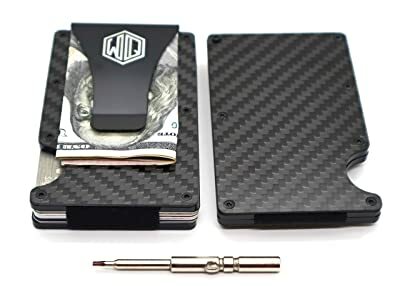 It’s not only a beautifully crafted slim carbon fiber wallet like other brands, but also includes a separate money clip and importantly, a maintenance kit. If you’ve ever thought that “you get what you paid for”, this will utterly break all that cognizance. With this, you get even more than that. Exactly, this sleek and compact minimalist wallet can fit initially 12 cards. But that’s not the final result since the elastic strap can be perfectly conditioned after a few days of regular use to fit your daily carry like a glove. And maybe, deliver some extra storage space. Many customers consider this as a perfect dupe of the Ridge Wallet and it’s not wrong. Though the Ridge’s quality is superior, you really can’t beat this one for the price. Its value is even more affirmed due to the 90-day money back guarantee and the 1-year replacement warranty. Just one small notice is their expanded measurements to give more comfort when stuffing your essentials. Consider your pocket before picking it! Actually, I’ve copped the previous carbon fiber wallet made out of alloy material but only until this 2018 version that I can find a match. It follows the minimalism with emphasis on simple construction with high-fashion vibe and functionality. Unisex so, it’s a good choice for both men and women. Thinking of this as a gift for somebody you love is also perfect because it comes in a nice packaging. Plus, is a full set of magnetic screwdrivers, 4 screws, and two metal pieces. They are very easy to setup and customize but hard to get breakage. As crafted from premium carbon fiber material, highlighting with durability and stiffness, it prevents wears and tears efficiently. Other benefits are lightness and slimness to fit both back and front pockets. But the capacity? Not a concern! It can fit nicely 15 cards and 5-7 folded bills. Not to mention to the built-in RFID Blocking Technology that’s US GOVT.FIPS 201 approved. Overall, it’s worth every penny of mine. Good purchase! Highlight with the advanced RFID Shield! 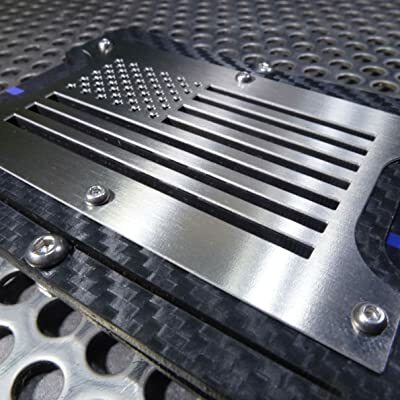 While a normal aluminum piece providing 27 microns thick already prevents RFID signals, this carbon fiber is leveraged up to 3000 microns of Premium Aviation Aluminum. Hence, the protection is now perfectly perfect. Like the Widely Quality model above, this is the 2nd version with many improvements. The best thing is its ultra-thin design to easily slip down in your suit pockets or pants pockets whilst avoiding bloated back or front pocket efficiently. Now, it’s no need to worry or feel embarrassed about that issue anymore. Not to say that the wallet is now much lighter to deliver more comfort and pleasure. About the capacity? Well, with some adjustment on screws, this little bad boy can hold up to 12 cards with ease in the most compact way. Other than that, you also have an aluminum money elastic clip that can accommodates 6-8 folded bills. If slippery is your most concern when it comes to this detail then don’t. The manufacturer already attached some silicone points to increase its grip to your money. Moreover, if there’s any manufacturing defaults (though it’s really rare), just ease in mind because this wallet is blacked by a 1-year warranty. This is my most favorite as I really love outdoor survival activities and sports, such as wild hiking, climbing, trekking, and camping. This package arrives in not only a sophisticated wallet with money clip, but also multitool card, elastic cash strap, key holder, mini screwdriver, stickers and instruction. Thus, it’s enough for a wild game. Even, Armour is thoughtful enough to give you free replacement screws in case of the old ones wear down. 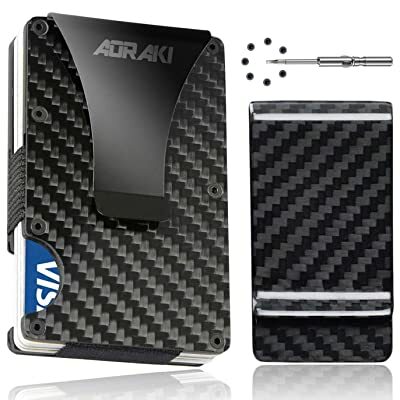 But don’t get it wrong, once purchasing this carbon fiber wallet, you will get a lifetime satisfaction warranty to cover all detects as long as they are from the manufacturing process. Plus, there is a luxury gift box included. What I appreciate the most in this product is their support to wounded warriors. Each sale will donate $1 to help that. However, that humane activity doesn’t make me biased to include it in this collection. Quality and function are always two top priorities. And they are already proved by me! 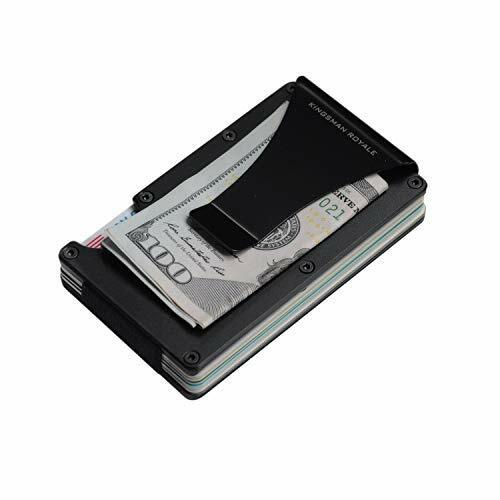 Come in a capacity of 5 folded bills and 12 cards with well-equipped RFID Blocking Technology, this buddy is sure to fit your EDCs with ease. Besides, thanks to the premium-grade Aviation Aluminum, which is considered as the strongest material, you can rest assured of a timeless piece to use with time. All in all, it’s a good buy. 7. The Steel Patriot Carbon Edition. 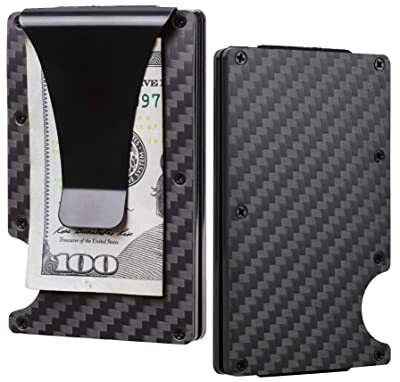 Minimalist Holstex Tactical Wallet Carbon Fiber Texture With Stainless Steel Front Plate. Multi tool and money clip. The MultiWallet is another minimalist steel RFID wallet. 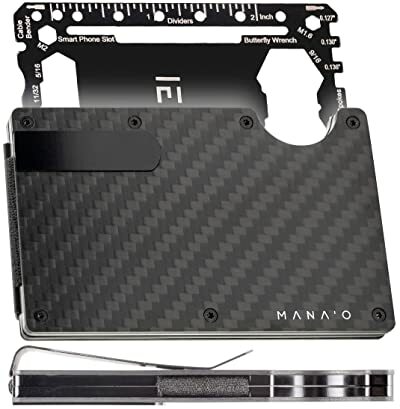 Made completely from the precision cut carbon fiber material and setup with high-grade screws, each wallet before released will be tested carefully to ensure the best quality. There are many options in this line, either the American Flag is color laser engraved or cut out on rust-resistant stainless-steel front plate. The wallet comes in pre-assembled so if your maximum cards are around 5, there’s no need to adjust anymore. However, if yours are up to 8 or 10, the enclosed spares kit is now in use. With some easy adjustment, its capacity is leveraged right away to fit your daily carry like a glove. Thankfully, they don’t forget the RFID Blocking Technology in this line. However, you need to buy these cards separately. Each comes in a size of roughly 0.5mm alloy to stay in your wallet with minimal bulk. 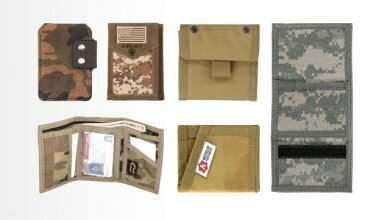 Though you need to pay extra bucks on these, I find it’s a good choice of MGear to give its customers freedom to customize their own wallet. The biggest and most common problem of using a slim wallet in general is its lack of a coin holder. Hence, if you’re in need to carry some, here is my suggestion! 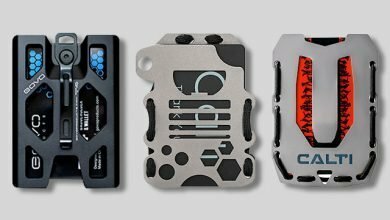 Aside from two metal plates, one adjustable elastic band and one money clip as normal, there is an extra premium lightweight aviation aluminum cavity card. This takes the role of carrying coins, pins, SD-cards, and small keys, with the same size of a usual credit card, featuring only 3mm thin, to fit any slim wallets. This product also highlights with a giant capacity of 20+ cards and some folded bills due to your preference with some simple adjustment needed. To keep such that huge load, the wallet is crafted from the highest durable materials. They are the aviation aluminum and premium carbon fiber so that you can feel ease in mind of a long service life and an exclusive touch feeling. On top of that, is the RFID Shield that can protect your private information against hi-tech thieves within 3 meters in 13.56 Frequency. Hence, so far so good! A typical problem when it comes to utilizing a carbon fiber is its lack of organizing. All of your cards will be placed in one compartment that when you’re in need of a particular card, it takes time to find and pick out. But this isn’t the one. Thanks to the convenient V-Taper along the bottom edge, you are now able to slide cards in and out through just a push. As this extra component might be in use regularly, it’s crafted from durable material to prevent loosening effectively. 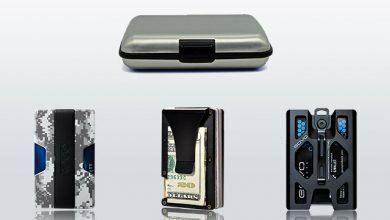 In terms of the wallet, it’s non-scratch design equipped with RFID Shield, featuring a slim and compact size to slip into your pant pockets easily. Contrast to its simple and thin silhouette, its capacity is amazing that can accommodate up to 12 cards at the same time without bulk. But the best thing is you will get a 30+ functional multitool card to be your best pal in many survival activities out there. And obviously, there is a screwdriver included to help you with some adjustment when in need. If you or your beloved one loves installing thing and outdoor sports, this is a perfect present. They allow you to leave a message engraved on the front plate. Besides, is a nice package that you don’t need to look for a gift box at all. Very convenient! What if you don’t find this wallet suitable for your demand? Easy! Just return it for no excuse. The product is backed by a reliable warranty so, just try it with confidence! 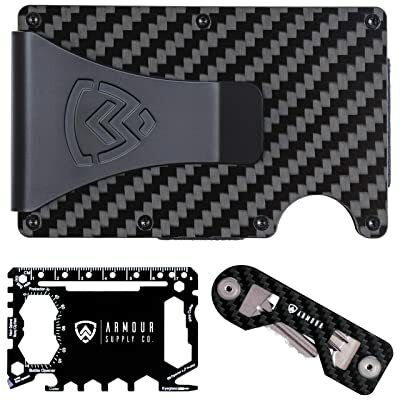 Last but not least is the GUARDIAN RIDGE Carbon Fiber Wallet. While other inferior models out there come up with weak connection points that results in easy breakage under just slight pressure, this brings a much more durable and sturdy feeling. 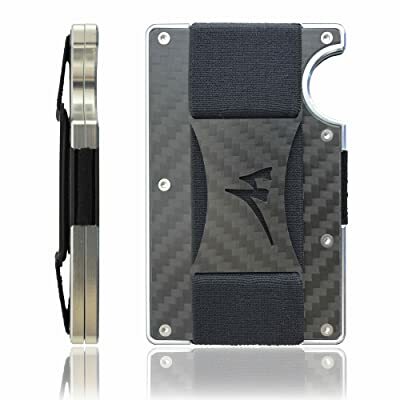 Crafted from high-quality aviation-grade aluminum and covered in premium carbon fiber material, the wallet brings a solider hand-feel than the steel with emphasis on lifetime lasting and scratch resistance. Take note that its built-in RFID Blocking Technology is already passed the US GOV. FIPS 201 Compliant to bring the highest protection to maximumly 15 cards within the range of 125 KHz. – 13.56 MHz Frequency. Contrast to its huge capacity is a slim silhouette to stay neatly in your pocket without bloating it embarrassedly. Again, arrive in a nice packaging, it’s perfect as a gift for somebody you love. Ease in mind as it’s backed by a 100% satisfaction guarantee. And that’s all for this article. Have you picked yours yet? I hope that my hard work helped you more or less figure out which is suitable the most for your demand, preference, and budget. Thanks for reading!